Last year Asus announced its Padphone which was not a very big success. However the concept of placing the phone inside a tablet design was really a great idea. Although, it did not attract a lot of customers in the market, it was able to provide a hint to a designer for his next concept design. Prashant Chandra an India based industrial designer has upped Asus Designers with his concept Lifebook laptop. 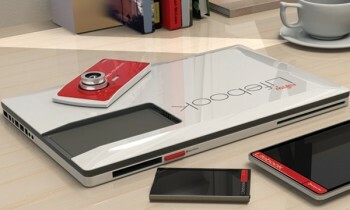 This concept laptop contains three sub-devices – a camera, a phone and a tablet and all built in one single device. However all can be easily detached. In his concept design he has placed the gadgets is a very clever way. The tablet is placed in the location of the keyboard. By snapping in the tablet into that location via a 16 pin connector it automatically goes to keyboard mode. The phone or the music player sits in a slot provided at the left of the device. Lastly the camera will reside at the lid of the laptop, which will also be allowed to be removed and used independently. Till now this model is only a concept design and no official affiliation has been confirmed by anyone. One of the plus points with this device will be all the gadgets will get charged at the same time the laptop gets charged. However the point of holes left while the other gadgets are removed or either of these components gets lost; the look of the model will suffer. Although this model has not got any official affiliation but for sure we can say that it is really a great design and if some manufacturer even put some additional implementations on this model taking it as a base design the output will be an exciting to product to watch.